Well it seems I owe a few people an apology. First of all, Nico Rosberg. I doubted you could do it. Even though many rated you very highly I was more cautious, unsure if you were indeed another Jenson Button - an excellent driver struggling for years in poor cars - or instead a slightly better Nick Heidfeld, certainly quick and consistent but perhaps not top drawer. Equally, that you spurned genuine pole position chances in the first two rounds of the year made me wonder if you were equipped psychologically to get the job done when the opportunities arose. Well, you showed me today and then some. After taking a serene pole, some half a second clear of your team mate (and everyone else) you won in masterful style today, leading just about the whole way. And this was no case being along for the ride with the best car: you had to nurse your tyres the whole way, as you were on a two-stop strategy (while most of your rivals stopped three times) and tyre life was seen as a relatively weak point for your Mercedes machine. You also had to keep your head at the points of the race when those behind on newer tyres were catching you hand over fist. This you did and did well. And yes, you were helped by a dud pit stop for your nearest challenger Jenson Button, which was compounded by him being condemned to run in traffic for many laps, but the likelihood is that you would have won anyway. Even Martin Whitmarsh accepts that. Of course Nico, this is not the end but just the beginning. What's important now is kicking on from here, and you've still to prove that your ability when in combat in the pack is at the level of the great drivers in the sport right now. But today, with your fine win, you ticked a lot of boxes. And I owe an apology to Mercedes. I thought you'd never get it right. I believed there were too many chiefs and not enough Indians at Brackley, and wondered even if there were fundamental flaws in that operation. This was especially so after the first two races of this year seemed to show yet another Mercedes not on the race pace, looking deficient at keeping tyres in shape over a stint. And I thought it was only a matter of time before the big bosses in Stuttgart had something to say about it all. But today it was almost like you were rubbing my nose in it. Tyres were never an issue for the Mercs today (aside that is, from the one that wasn't attached to Schumi's machine properly at his first stop, putting him out). Indeed, you were the last to change tyres of the front runners, and you pitted one time fewer than your closest challengers. And the expected tyre degradation 'drop off' never happened. It seems to back up Ross Brawn's recent claims that the struggles in Australia and Malaysia were down to set-up errors rather than the car being irretrievable. It perhaps suggests that the car has a rather narrow operating window, and the next round, at Bahrain, will be much hotter so will represent a new challenge. But if the sweet spot can be found with regularity then more wins, perhaps even a championship run, aren't improbable. And finally, may I offer an apology to Mercedes's strategy staff. I was convinced that mid race, when Button on fresher tyres was taking huge bites out of Rosberg's lead, that you'd dropped the ball. I also recalled that in China last year Sebastian Vettel lost the race trying something similar: i.e. sticking to a two-stopper out front rather than matching the cars behind stopping three times. But you showed me you were right to stick to your guns, and in the end Rosberg won by twenty seconds plus. It's rather touching that I thought I knew more about strategy than Ross Brawn, the accepted pitwall genius. Remind me not to doubt him again. And with humble pie duly consumed, let's take stock of the long-overdue firsts that today's Chinese Grand Prix result represented. As well as being Nico's first Grand Prix win, it was also the first debut win for any driver since Mark Webber's in Germany two and a half years ago. It was also the first win for someone other than the 'big five' (that's Vettel, Webber, Hamilton, Button and Alonso) since Monza in 2009 when Rubens Barrichello won for Brawn, and indeed it is the first win for a car other than a Red Bull, McLaren or Ferrari since that race too. And it's Mercedes's first win as a constructor since their last triumph which was also at Monza, but in their case in 1955! And even beyond the novelty of the result, what a wonderful, diverting race it was. And it was so without relying on rain, safety cars, or even DRS especially. Instead it was down to a close field, variation in race strategy and aggressive and skilled wheel-to-wheel dicing. Most of the close action took place far behind Rosberg, but in second place downwards there seemed to be a tightly-packed snake of cars for just about the whole distance. And for the first time this year spice was added by a large-scale split of strategies, just as the new Pirellis, with compounds closer on performance, were designed to create. A three-stopper was the 'norm', but many chose to gamble on stopping just twice. It was a decision that appeared knife-edge, indeed Kimi Raikkonen sank from second place to finish fourteenth in what seemed a blink of the eye as his tyres fell off a cliff, and Vettel also sank from second to fifth in the final laps. But the race came to many of the two-stoppers. 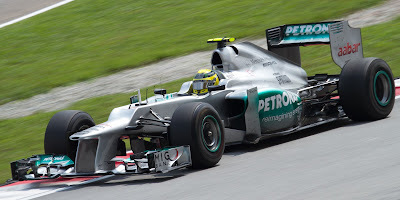 Rosberg won with this strategy as mentioned and Romain Grosjean, Bruno Senna and Pastor Maldonado finished in line astern from sixth through to eighth, their approach allowing them leapfrog many three-stoppers. It's a timely result for Grosjean - who was receiving criticism for barely completing a lap in the first two rounds (it's fascinating as well that the two-stopper worked much better for him than for his team mate). And Williams continued their welcome partial renaissance with a double points finish - their first since Korea in 2010. The DRS here didn't seem to offer much of an advantage, which in turn meant that track position advantage was more akin to 2010 and before than what we've grown used to more recently. This further helped the two-stoppers. If this continues, the teams will have to re-calibrate their strategy simulators. As expected, the McLarens and Red Bulls re-asserted themselves on race day in China, and they filled the next four places in Rosberg's wake. Lewis Hamilton continued his good 2012 form by recovering from his grid penalty to come third. It's his third third (as it were) in three races (three is the magic number it seems), and it puts him atop the championship. Whisper it, but are we, after all of his 2011 struggles, seeing a better Lewis this year? A lot of the pace and crisp aggression in traffic remains, but we've also seen none of the desperation and ill-judgement that was on show last season. Indeed, it's all a bit reminiscent of the Lewis of 2007. And that Lewis wasn't bad, was it? And Mark Webber also continued his good form, looked racy the whole way and finished a close fourth, once again ahead of his team mate. 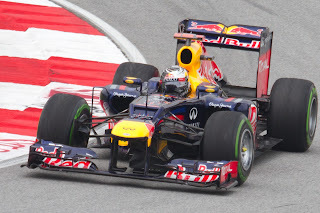 But for all of the Red Bull changing-of-the-guard talk, Seb also did very well today. After sinking back to fifteenth place at the start (with a start we'd more associate with his team mate) he managed to ghost up to second place late on helped by strategy, only to sink back on old tyres as mentioned. Because of this after the race he continued to have, as they say in my home land, a face that could stop a clock. But that's how it should be: fifth place is not going to register much on the Vettel-ometer. And Fernando Alonso, also as expected, lost his championship lead today, by only claiming two points for ninth place. He looked mighty as always throughout, running close to Webber and Hamilton, but was caught in the wake of the two-stoppers in the final stint and seemed compromised by a run off the track after trying to pass Maldonado. Still work to do at Maranello. And credit where it's due to Felipe Massa, who was only five seconds shy of Alonso at the end. Unfortunately for him, in a closely-packed field that translated to thirteenth place and no points, and he's now got the unwanted record of being the only driver outside of the three 'new' teams not to have scored a point yet this year. Still, if he can stay about this close to his team mate the talk of him being replaced before the season is out should recede. And Sauber disappointed, after all of their promise from their Malaysia run and China qualifying they sank to finish tenth and eleventh, with Kamui Kobayashi ahead. Curiously, neither Kobayashi on his three-stop strategy nor Sergio Perez on his two-stopper made their strategy work as well as the others who tried it. Odd given that tyre management is meant to be their strong point. Plus, Kobayashi set fastest lap, so there remains pace in that car clearly. For whatever reason it was never maxed out today. 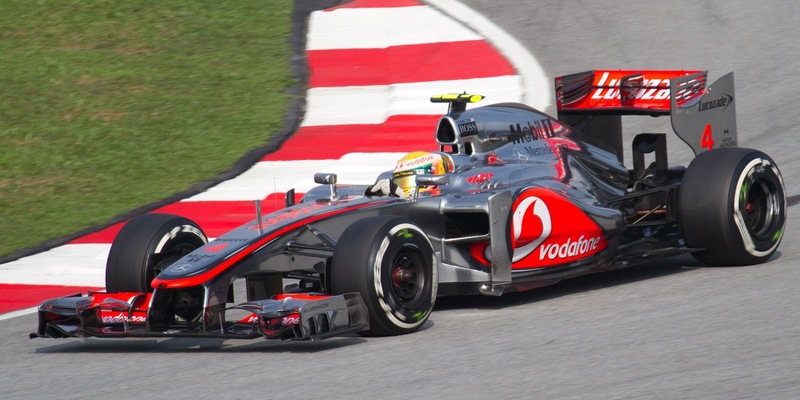 But today was all about welcome new players at the front of the F1 pack, and a competitive field providing a great race. F1 in 2012 is shaping up beautifully.